The REACH. POSSIBLY THE ULTIMATE PRESENTATION? You can learn to combat drag in most fishing situations within 10 minutes. I can teach you now! Even absolute beginners who have never held a fly rod before can learn both the foundation casting stroke, and slack line presentations right this minute! The secret is learning the reach cast. Follow me! 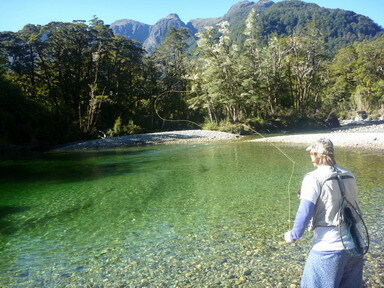 On the river there are very few situations where a simple, straight-line presentation will not result in drag, the fly and line moving faster or slower than the flow of the river. The reach cast is essentially an In The Air (ITA) mend. That is, the mend is placed in the line before it falls on the water. 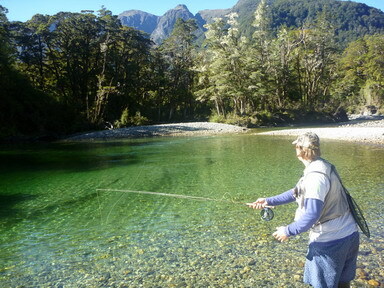 The advantage this has over On The Water (OTW) mends is that the line falls ready to fish, and you are less likely to spook trout this way than when mending the line on the water, as it is drifting down towards the fish. It is important when reach casting to remember to stop the rod high enough on the forward cast to ensure the line straightens above the water, not down on it. Also important to remember before we begin; as you reach, you'll notice that the fly will be pulled toward you unless you shoot line during the reaching motion. This should be one fluid motion – shoot and reach. Ensure you have enough available slack line off the reel to facilitate this shoot. However in windy conditions, where shooting line into a headwind is likely to sap your cast of energy, or when required to shorten your line in mid air, you may not want to slip any line at all Each to his own. 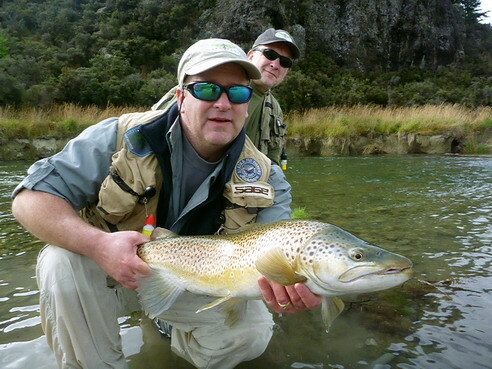 A beautiful fish nailed with an upstream reach to attain a deeper nymph drift. Learning to reach cast can be as simple as picking up a pen! Lets begin with a simple pantomime technique – the overhead cast. Hang your casting arm loosely down by your side. Nice and relaxed. Now bend at your elbow so that your forearm is holding parallel to the floor. Point your finger to simulate your rod. Wherever your finger points, your rod tip will ultimately point. This is your ready position. Reach up and touch the top of your ear with the tip of your forefinger. Congratulations, this is your back cast! Now perform a smooth, downward karate chop to a point around halfway back down to your ready position, around 45 degrees to the parallel. This is your forward stroke. Now relax your arm and let it fall back down to the parallel, your ready position. Congratulations, you have just performed the basic overhead casting stroke! You will notice that to touch your ear you must lift your elbow slightly. This is important I feel when casting, for it brings into play the larger muscle groups of the shoulder to help with the lifting / pulling motions. If your larger muscle groups are employed to do the heavy work, the weaker, more easily fatigued muscle groups can stay fresh to manipulate the more delicate motions of the cast. In this basic overhead cast there are three points. 1 = the ready position, 2 = the back cast stop position, 3 = the forward cast stop position. Repeat this pantomime exercise until it feels natural, pointing your index finger at the three aforementioned points to build a repetitive, consistent stroke. We will describe the following as performed by the right-hander. We lefties can just reverse the directions. Alls you need is an imaginary pen! The river flows from right to left. There is a tongue of faster water in between yourself and the trout. A straight-line presentation would result in that portion of your line nearest the rod tip immediately being swept downstream, dragging the end of the line, and hence the fly unnaturally with it. 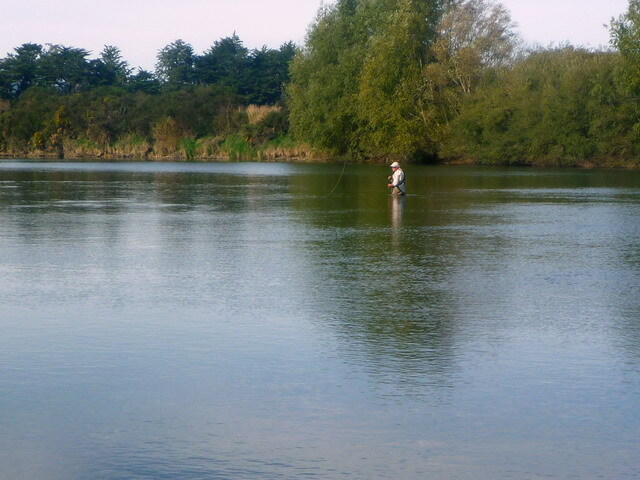 The solution here is to throw an upstream belly of line into the faster current, to ensure a drag free drift of the fly. To perform: Now go back to our pantomime technique. Reach up and touch the tip of your ear. Smoothly karate chop down to 45 degrees and stop. Now what I want you to do, is reach over to the right, away from your body palm up, and pick up an imaginary pen off the desk beside you. When you are done making the reach, your palm is up, your hand is extended; your arm is extended away from your body. So we make the cast, reach over, pick up the pen, palm up. The river flows from left to right. There is again a faster current in between yourself and the fish. A straight line presentation would again drag instantly. We want to throw a belly of line to the left, upstream into the current. River flows right to left. There is a slower current in-between yourself and the fly. A straight-line presentation would result in the fly overtaking the fly line, and dragging below. Here we want to throw a downstream belly of line across the slower water so that the fly can drift down naturally and catch up. To perform: Reach up and touch the tip of your ear. Smoothly karate chop down to 45 degrees and stop. This time the pen is on the desk to your left. Reach across your body to the left and pick up the pen, palm down. Simple, this is the Reach Left! You are thigh deep in the Mataura river in Southland, and a desirable brownie is gently sipping spinners 40 feet downstream. To throw a straight line would attain instant drag, as all is tight and the flow pulls the fly downstream and away from you. You need a reserve of slack line you can feed under control into your drift. To perform: Pantomime your cast again, but this time, reach smoothly up and back, around halfway back towards your ear. The pen is now on a shelf just above eye level. Just reach back nice and slow and pick that pen off the shelf. This is the Reach Up and is used for creating a reserve of slack line hanging from the rod tip, and also for quickly shortening your line in the air. Simply lower the rod tip to feel this slack onto the water as required. You are fishing upstream into a pocket in behind a rock or other similar obstruction, or maybe on a spring fed stream. The problem here is the many different currents pushing and pulling both your leader and line in different directions. You want a series of ‘S’ curves in your line to accommodate these, and to allow an unhindered drift of your fly. To perform: Perform your pantomime cast, but this time reach out, and down so that your imaginary rod tip follows through right to the waters surface. Reach up and touch the tip of your ear. Smoothly karate chop down to 45 degrees and stop. Now reach down and outwards to pick up the pen. It is right there on the desktop in front of you. This is the Reach Down and is used for creating a series of ‘S’ curves in the end of your line. You are essentially pulling down the rod leg of your loop, collapsing your cast onto the water. There you have it, the four foundation aerial mends. Practise each pantomime until they feel natural. Repetition builds muscle memory, the key to effective fly-casting. The transition to rod and line should be smooth – you already have the motions, just add water!